Thought leadership is often one of the most important elements to help drive value for an organization. It is a tried and true communication best practice, and one which often earns the highest rate of professional return for leaders and their organizations. It comes in many shapes and forms, and we’ll get to those, but first, here are a few reasons to be sure you and your organization are ready to build a thought leadership program. Why Build a Thought Leadership Program? One or all of these reasons should have you excited to explore if you’re ready to establish a solid Thought Leadership program. If you’re ready to dive into that exploration, read on. Getting on the path to developing a Thought Leadership program starts by asking initial, key questions that must be thought through thoroughly, and answered honestly. This evaluation allows for the communications team to look at the many facets required to position and build a solid thought leadership program. Upon having honest answers to the questions outlined below, it is then that the strategic path can be laid out. What topic, issue or product can my organization stake our claim on? Do one or more executives have a robust command of the subject? Who is/are best thought leaders or experts on this subject? Does the individual or individuals identified as the thought leaders or experts have the ability to best articulate our position on the topic, issue or product? Can the identified individual deliver defined key messages on the topic? Does the individual have the skills to build upon those defined key messages in both taped and live settings? Is the individual open to constructive feedback offered during a media/speaker/on-camera delivery training workshop? What availability does the individual have to include the necessary prep and ongoing support work required to sustain a consistent Thought Leadership program? Are there work-arounds to save on his/her schedule to allow for fitting prep time in? Is my organization committed to building a sustainable program over time, to serve as a foundation by which our messaging can build as the industry evolves? How will we measure success for our Thought Leader(s), so they know their efforts are moving the needle for our organization? 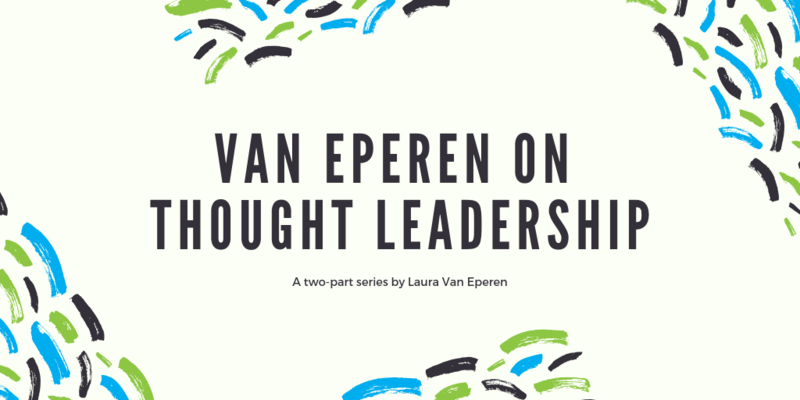 If your organization needs guidance with conducting an evaluation or deployment of a Thought Leadership program, Van Eperen is ready to assist you. Contact Laura Van Eperen at Laura@VanEperen.com. Part Two of this Thought Leadership series — Essential Elements of a Solid Thought Leadership Program – will be posted in the coming weeks.